Professional painters like to use sprayers because they can get the paint onto the walls fast, but they like rollers because they leave the desirable texture on the wall. So to get the best of both you will often see a painter spray first and roll second. The new Smart Power Roller System from Wagner also offers the best of both, but does so with one tool and in one step and at a lower price. The Wagner Smart Power Roller is like one of those systems that delivers the paint to the inside of the roller from the handle, but instead of a manual pump handle, the system uses an electric pump that attaches directly to your one or five gallon paint bucket. The system is controlled directly from the handle and can accommodate a 3-inch edge roller up to a 9-inch roller thanks to a variable speed dial that allows the user to match the speed to the task at hand. 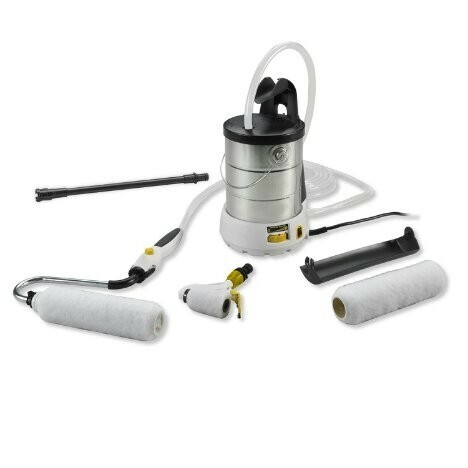 A 16-foot hose is included with the system so you can reach all four corners of the room, and an 18-inch handle extension and splatter guard can be added for ceiling work. The Smart Power Roller is touted as being mess-free and even has a built in self cleaning function.